Heat oven to 425°F. Spray 13x9-inch (3-quart) glass baking dish with cooking spray. In 12-inch nonstick skillet, cook sausage and onion over medium-high heat 5 to 7 minutes, stirring occasionally, until sausage is no longer pink; drain well. Stir in pasta sauce and oregano; cook until thoroughly heated. In medium bowl, beat egg. Stir in ricotta cheese, Parmesan cheese and 1 1/2 cups of the mozzarella cheese. Unroll dough for 1 pizza crust. Press in bottom and 1 inch up sides of dish. Spread cheese mixture over dough in bottom of dish. Spread sausage mixture over cheese mixture. Unroll dough for second pizza crust; place over sausage mixture and press edges to seal. Cut 4 slits in top crust. Bake uncovered 15 minutes. Cover dish with sheet of foil to prevent excessive browning. Bake 9 to 11 minutes longer or until crust is golden brown. Top with remaining 1/2 cup mozzarella cheese. Let stand 5 minutes before serving. 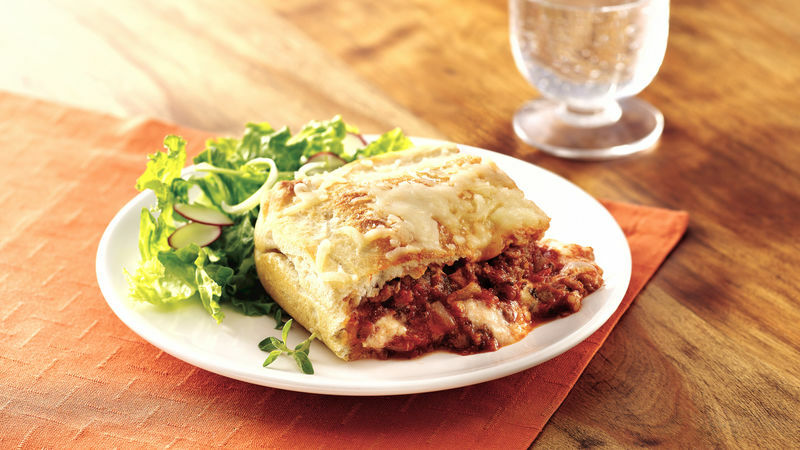 This pot pie has all of your favorite lasagna flavors without all of the time-consuming assembly!